The use of digital surveillance technology is rapidly growing as it becomes significantly cheaper for live and remote monitoring. 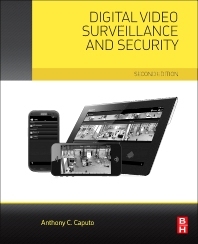 The second edition of Digital Video Surveillance and Security provides the most current and complete reference for security professionals and consultants as they plan, design, and implement surveillance systems to secure their places of business. By providing the necessary explanations of terms, concepts, and technological capabilities, this revised edition addresses the newest technologies and solutions available on the market today. With clear descriptions and detailed illustrations, Digital Video Surveillance and Security is the only book that shows the need for an overall understanding of the digital video surveillance (DVS) ecosystem. Anthony C. Caputo has been a senior technical consultant since 1998, with eight years of hands-on DVS and CCTV experience, and over eighteen years of networking and digital video experience. Worked as a DVS Architect and system engineer in public transportation, education, retail and municipals having worked on homeland security and surveillance projects including City of Chicago; New York City; Dallas; Rochester; and Basra, Iraq. He is also the published author of McGraw-Hill’s Build Your Own Server and has presented at conferences on the importance of a network security plan, and his multi-dimensional view for troubleshooting networked video. Caputo also provided the Keynote Speech "The Future of CCTV" at CCTV World 2011 Conference in Sydney Australia in December 2011. He is a subject matter expert and is certified in a number of technology disciplines, including project management with PMI (PMP), CCNA, CWNA, Genetec Omnicast and Security Center, Firetide Mesh Network Engineer, object-oriented analysis and design for business process improvement, and a Microsoft Certified Professional. He holds a certification as an IBM e-business Solution Advisor, helping IBM write the exam for certification and in encryption and security from the University of Chicago.